Side by side the Wynn Hotel and Casino and its sister property the Encore Hotel and Casino make a striking pair. Both feature a bronze exterior with golden signs in the top left corner and are situated along the famous Strip in Las Vegas, Nevada. Striking but simple lines attract the eye to these two world class hotels whose theme is Art imitating life. Wynn Hotel and Casino and sister Encore Hotel and Casino are situated along the Strip in Las Vegas, Nevada like many of the main, themed hotels in the city. 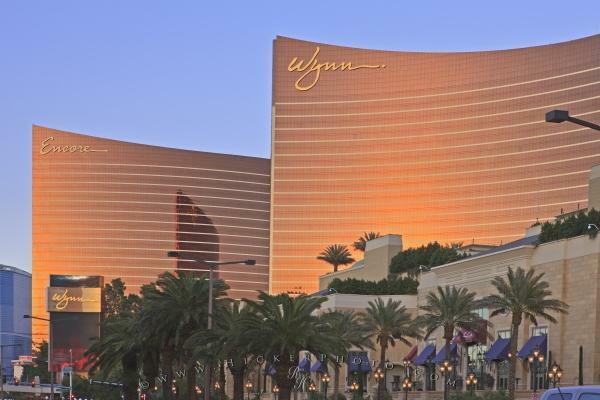 Photo of the Encore and Wynn Hotel and Casino complex along the Strip in Las Vegas, Nevada, USA. Pictures from photo gallery "Las Vegas Pictures"
This picture is part of the photo album "Las Vegas Pictures" - there are more beautiful images waiting for you.